Shipping containers can be really damp inside. The combination of cold steel and humidity often results in condensation and a lot of it. The moister the climate the more problematic this is. Here in the Pacific Northwest, water literally rained off of the interior surfaces during the winter. Understanding condensation is important. Each climate is different, so the lessons given here may not apply to other locations. I would highly recommend hiring an expert to help you determine if moisture is going to be an issue ahead of time. A shipping container’s interior surface is corrugated, so it’s difficult to prevent moisture laden air from reaching the steel. 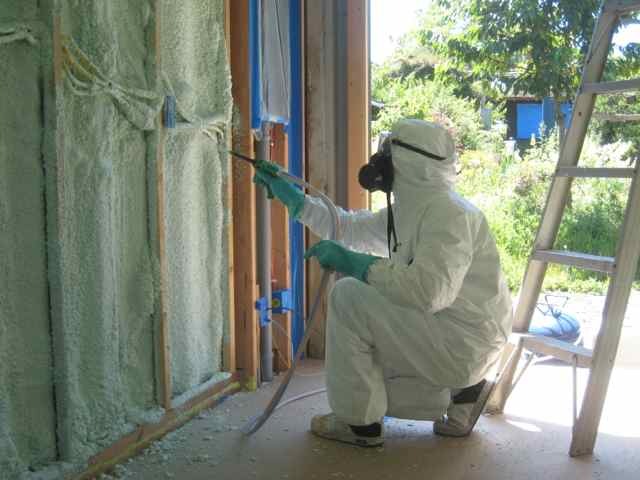 In our case, we applied a modest layer of closed cell spray foam to the interior which bonded to the uneven surface and moved the dew point away from the steel to prevent condensation. The foam also acts as a sound dampener and helps to mitigate temperature swings somewhat. We used a two-tank kit that we purchased online. Installation was fast (1-2 hours).